This post contains affiliate links, where I would receive a small fee if an item is purchased. However, there is no additional charge to the buyer and I only post about items I truly enjoy. 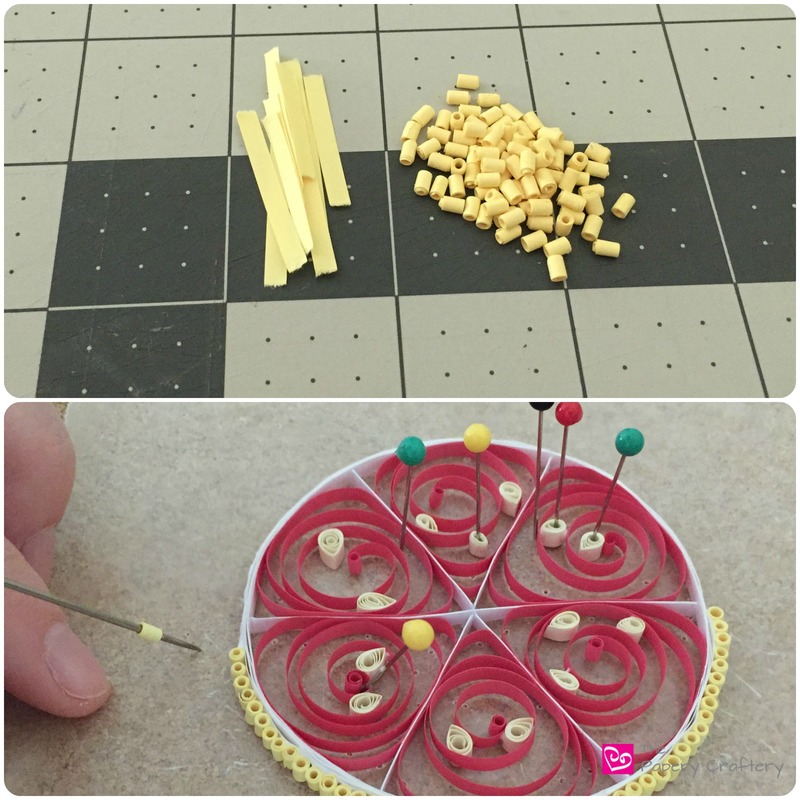 I really enjoy creating quilling projects inspired by everyday objects. In fact, one of the most amazing things about paper, in my opinion, is the way it can be transformed with a few twists and turns and a little imagination. 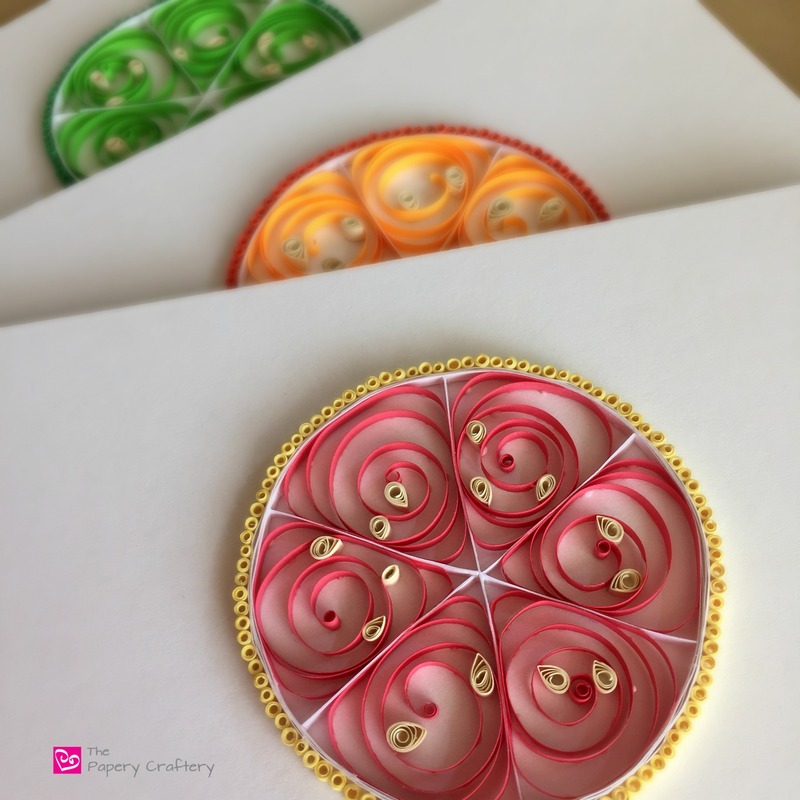 When I started my handmade quilling decor business, I started with simple designs based on fruit and vegetables. One of my most recent designs are my quilled citrus fruits. 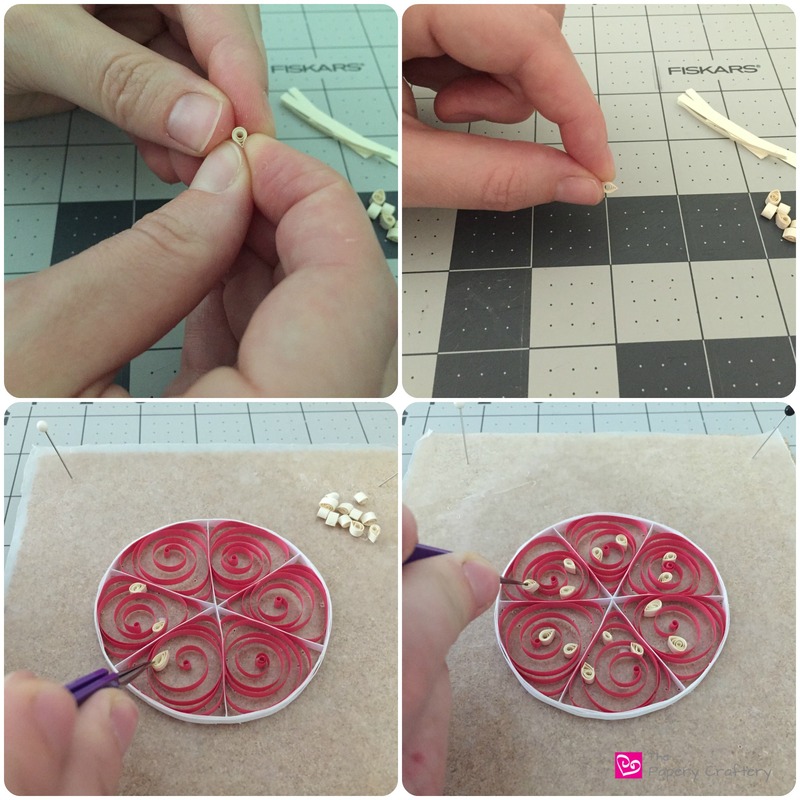 For those quilling fans out there, I thought I’d share a tutorial and describe how to make a quilled paper grapefruit. 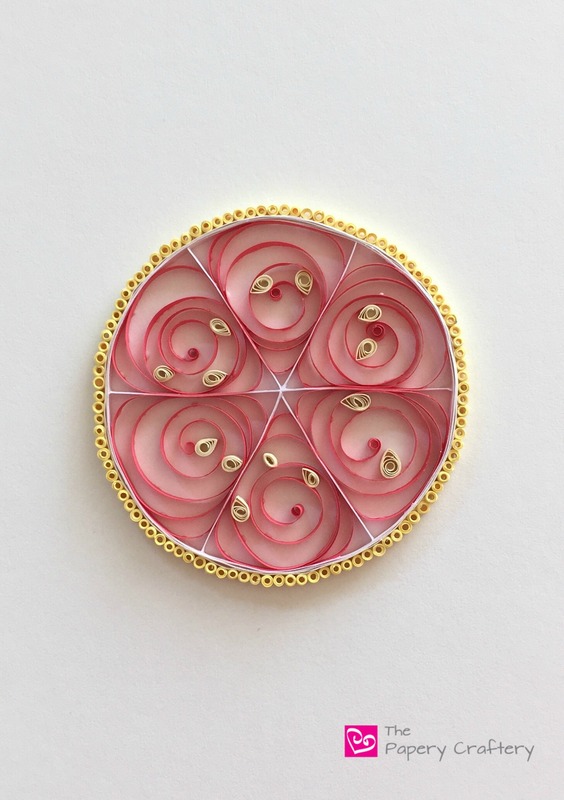 To start, I glued together two white strips of quilling paper to create what would be the rind of the grapefruit. Then, I had to decide what size I wanted my grapefruit to be. 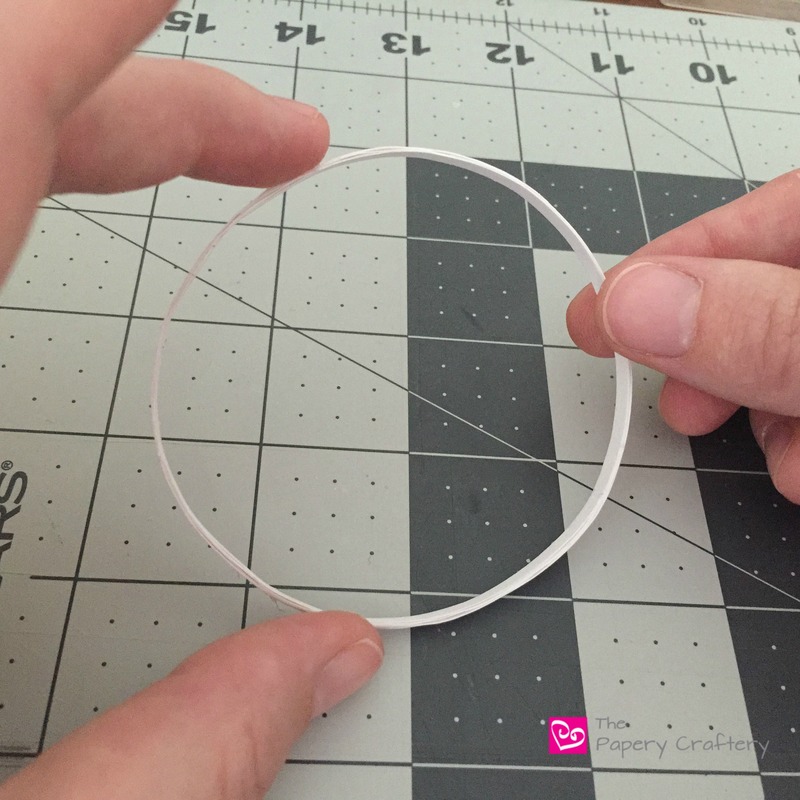 Since I wanted it to be about the same size as the rest of the designs in my shop, I used my round glue bottle with a 3″ diameter to wrap my double-thick white strips around about 4 times, using teeny dots of glue as I wrapped to secure the strip. 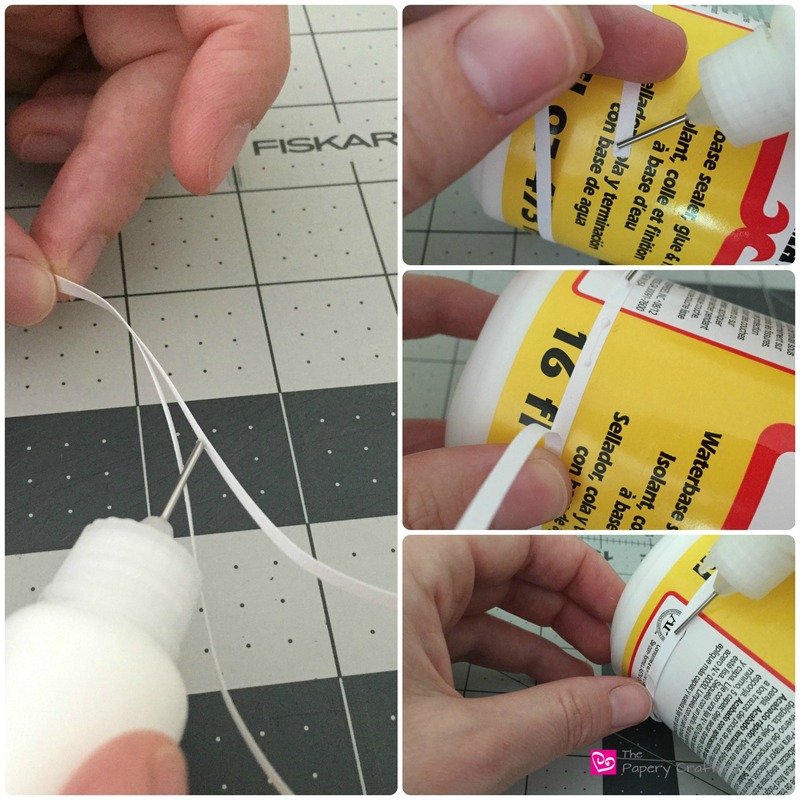 This technique created a really solid circle that I could remove from the bottle, once the glue was dry. I used the another double thickness of white paper to create the pith that seperates the fruit segments. 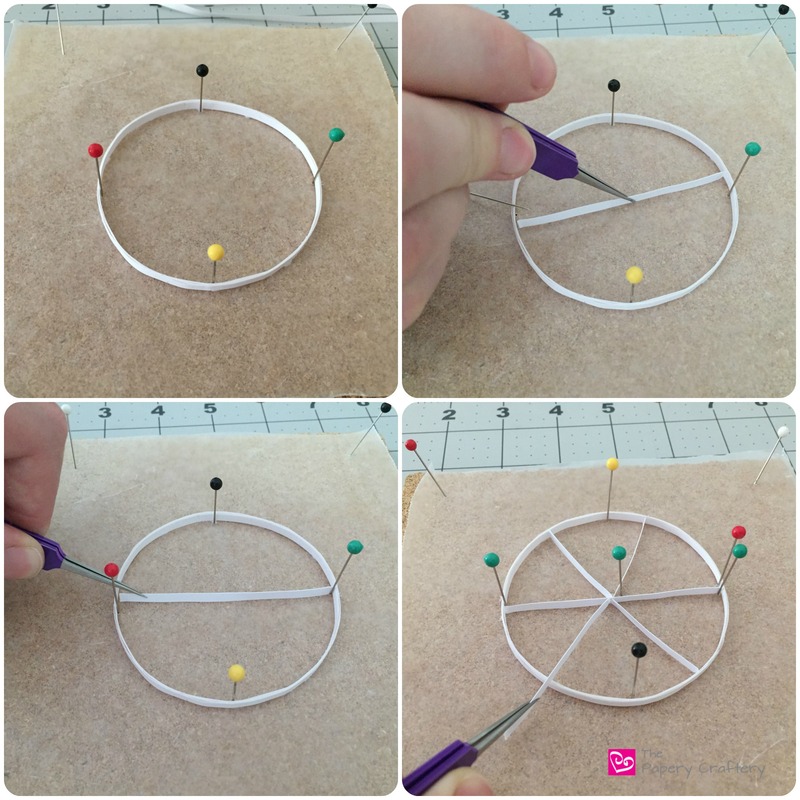 It was as simple as measuring strips, gluing one in the center, then a few others to make 6 equal sections. Next comes the grapefruit segments! Since I was aiming for a ruby red grapefruit, I chose a deep rose paper in a 12″ length. I created a large loose coil and inserted that into one of the sections of the grapefruit. 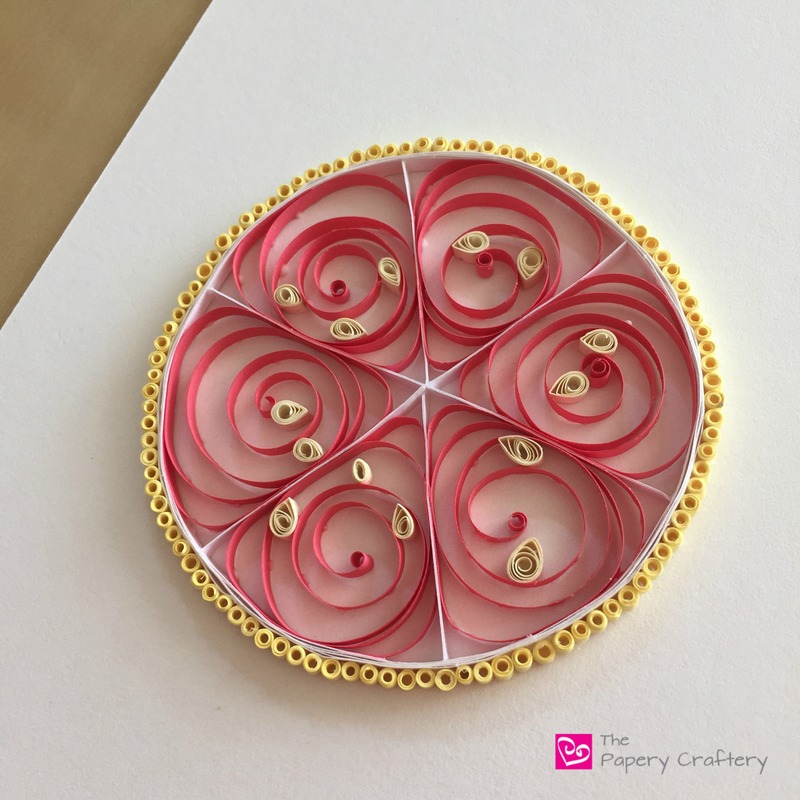 (For a reminder on basic quilling shapes and coils, check out these free printables!) With a little glue and a few pins I had the coil spread out to fill the entire segment. If you were looking for less open space in the coil, feel free to use a longer strip of paper! Repeat the open coil process for the other 5 sections of the grapefruit. Now its time for the seeds! I chose cream quilling paper for the seeds, in various lenghts between 1 1/2″ and 2 1/2″. Since nature isn’t perfectly even all the time, your seeds probably shouldn’t be either. The seeds were made into a simple teardrop, and placed wherever there seemed to be room. Some segments have 2 seeds; some have 3. The grapefruit rind was made from many, many 1″ pale yellow strips, quilled into teensy tight coils. These coils were glued around the entire outside of the grapefruit to finish. That’s about it! This quilled paper citrus fruit design can be used in so many ways. Maybe make a bunch, string them together and use them as a summery garland! 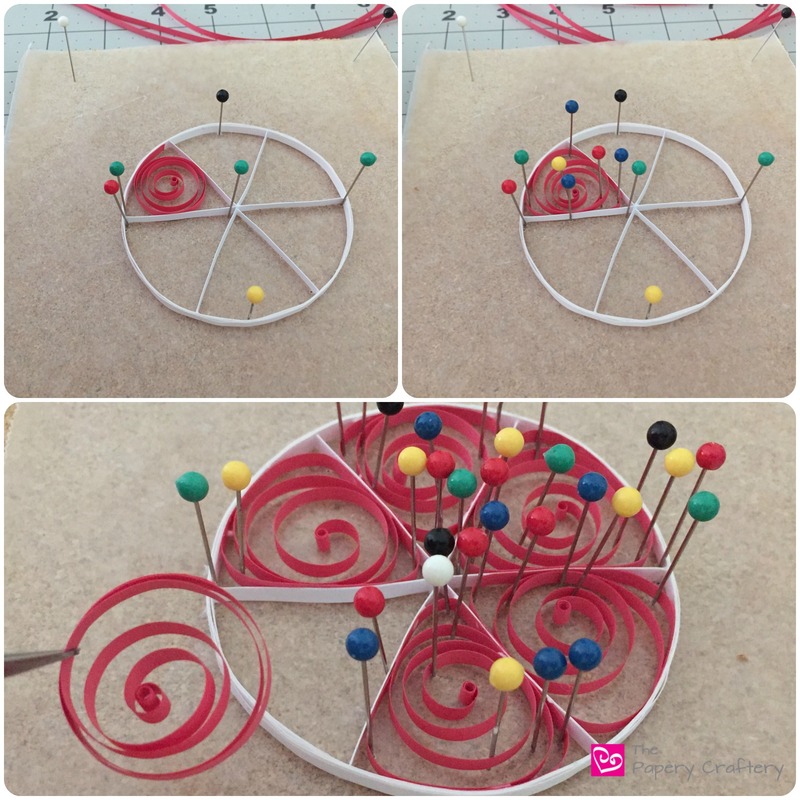 Check out this post on my quilled cupcakes, where I use mini half-oranges as cake toppers. Frame a few and use them to dress up a kitchen. I wanted to make my Moose a fruit themed nursery at one time, and these would have been perfect! Go ahead and give quilled paper citrus a try! (But if you’d rather let me take care of the quilling, check out my Esty shop!) I’d love to hear how it went and how you’re using your design. Leave a comment below!